In the mid-19th century, French physicist Jean Foucault (foo-KOH) became the first scientist to demonstrate the rotation of the earth using laboratory apparatus instead of astronomical observations. In 1851 he shared his pendulum demonstration with the public at the Parthenon in Paris, where it can still be viewed today. The Foucault pendulum at Puget Sound is located in the center of the spiral staircase in Harned Hall’s main lobby. Hung from the ceiling of the third floor, the cable pendulum is suspended over a base with inlaid wood in a beautiful Penrose pattern. The pattern is named for British physicist and mathematician Roger Penrose, who, in the 1970s, developed sets of shapes to tile a surface in regular, but nonrepeating patterns. 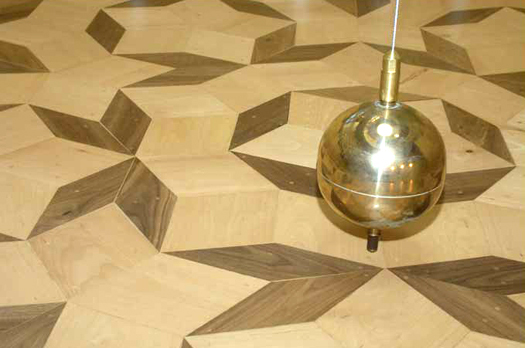 The university's pendulum base was designed and constructed by Professor of Physics Alan Thorndike. All pendulums consist of a cable (or wire, or string) and a “bob,” a symmetrical weight at the bottom. The cable and bob are suspended over a base, called an oscillating plane, which remains stationary. When the cable is set in motion, it will swing back and forth in the same direction unless pushed or pulled in another direction. This is due to one of Newton’s basic laws of nature: a body in motion will remain in motion unless acted on by another force. Yet, if you watch the pendulum for any length of time, it appears as though the pendulum changes direction. This is an illusion. The “stationary” base (and everything else connected to the earth) is really what’s moving, rotating around Earth’s axis every 24 hours. The result is stunning, visible proof of the earth’s rotation. With each swing, friction, air currents, and other forces cause all pendulums to lose energy, and the Foucault pendulum at Puget Sound is no exception. Left to itself, the pendulum would swing in ever smaller arcs until its movement decreased almost entirely. To keep the pendulum going, a small motor has been installed in the ceiling to give the cable a little “kick” when it reaches a particular point in its swing. This restores the energy that has been lost and prevents the pendulum from stopping. The “kick” has no effect on the direction of the pendulum’s natural swing, so the demonstration of the earth’s rotation is unaffected.